I thoroughly enjoy perusing the Geekery section on Etsy. I never know what I will stumble upon! I have also discovered it is a great place to look for gifts for fellow geeks. Have you been struggling with the age old question of whether vanilla or chocolate is better? According to DogBoneArt, pirates rrrrrr the tastiest. 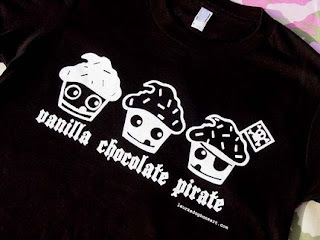 You can make sure everyone knows it with this Pirate Cupcake Tee Shirt. Of course, eating delicious cupcakes often leads to feeling guilty about consuming too many calories. 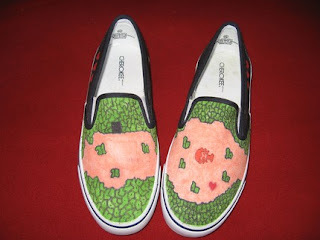 If you are so concerned about keeping in shape, then take a walk in OhMy's Old School Zelda Shoes. 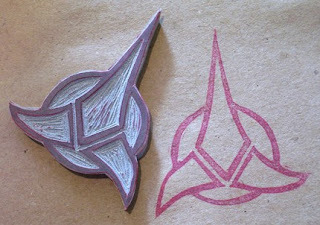 Lastly, make your mark with the Star Trek Klingon Logo Rubber Stamp by NerdNook. Add it as a personal touch to your outgoing mail, stamp some blank cards and send them to your friends, or tag random areas that need a kick of geekery! Boldly go where no one has gone before with all of these accessories and more on Etsy. Oh, I forgot to mention that each order of the zelda shoes is hand drawn with permanent fabric ink and Scotch guarded for extra protection! I'm wondering about the trademark protection on that Klingon stamp! I've never seen the "geekery" category before! Thanks for opening my eyes to another part of Etsy.